All transactions are safe and secure with a reliable history in online purchasing behind each of our associates. Buy the Cowbell Hero t-shirt to own More Cowbell clothing and merchandise. The front of this tee combines the famous SNL catchphrase, "Gotta have more cowbell!" with the Guitar Hero logo. The humorous design on this T has helped to make it one of the most popular SNL More Cowbell t-shirts available. 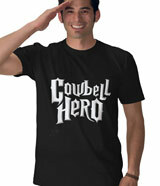 Wear this dark tee so that everyone knows that you are the Cowbell Hero. We can't wait for the video game. The design is available on a handful of different color ts to choose from, including black, white and ash grey. In addition to the Cowbell Hero tee above, browse the More Cowbell Clothing Gallery for more apparel like men's and women's clothes, kids shirts or hoodies.